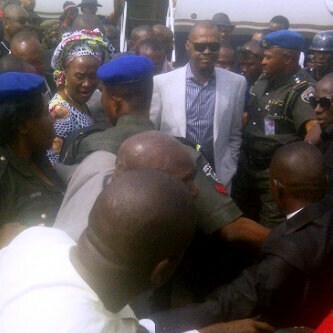 The governor arrived Enugu today. He's presently in government house. Happy he's well and back! WELKOM BIG BROS...THANK GOD IT IS NOT THE CASE OF LATE PRESIDENT YA...DUA. Finally!! He is back ooo.... Yaya! First 2 comment! Chai, yawa don gas. All the people that have said rubbish and called for his resignation are in soup now. Yepa! Oh thank God! I was almost scared for his life! So happy he's well again! The most handsome gov. We hav in nigeria :D I like him die! So happy for him. I pray Cross River Governor arrive in a good health soon. I heard 4rm a reliable source dat d guy has a vry serious/chronic kidney problem%he's also HIV positive. Welcum back,so happy for him. I am glad that governor Sullivan is back. Yipee! !the oringo governor is back,hope he will throw α̲̅ party 4 his recovery. U̶̲̥̅̊ can easily tell frm that pic,that he was very sick.so glad my governor is alive and well! Oh! My love is back..missed you a lot.. I love this man so much and am so glad he is back. Onyx! Nigerians can never sieze to be funny. They are lucky Boko Haram are not yet in d South East. Everybody want to see nnd lick d governor. Tufiakwa unu! Thank GOD our Governor is back! Happy for him! Welcome back Chime...but I know dis one na to show face and disappear again. Yeah dts my gov, welcome home sir, though stil looks fragile. Chei, see the almighty Chime don turn like this? He looks so sick.. May God heal him oooo. Amen. thank God. thats if he wont be going back on monday. It's good to lead and not rule. Sully banyi!!!!! Enugu was something else today. We thank God you are back. I pray other state governors would have your heart. Sullivan is a man of the people. We love him to bits. thank God. now lets know what happened to him. welcome back Mr Gov. I hope u have fully recovered and gained back ur strenght because u owe your people some explanations.once again nnoooooo. To God be all the Glory... Welcome home His Excellency. Nno Odogwu Nwoke. May Ur days be long sir..
hospitals in enugu state not good enough for you mr governor may God judge you. Am hapy 4u my gud gvnr. Pls complete dat vilage rd u startd o. Am talkn abt AFFA town in UDI. Thank u sir. Frm iyke ode. Happy to see him back but he should strike a balance between his health and Nigerian politics. Linda,are u sure u r happy he is back?No more story for u from dat side. Hey ya he has lost weight. I hope his near death experience will make him a more honest leader and think of the masses. There is sometin abt dis guy, I hav neva met him bt I lov him dearly.welcome mr governor u will live long t c ur children children. glory be to God u're back and healthy. God has perfected ur healing. May your days be long. Welcome sir! All those people here who want him dead i think you should check if you own governor has done 50%of what he has done in Enugu with that little peanut they called monthly allocation..we wish you what you wish him..Amen. To God be all the glory ,the enemies of enugu state have been put to shame.I am not an indigene of this state but I adore and love his excellency for his uncommon achievements.God will continue to protect and bless you. Its obvious u re hitting on d governor. Carry ur fat self to someone else cos he will never ping u.
watever the illness be, i join other believers to send it to Ota farm IJN.......AMEN.WELCOME BACK TOTHE BEST GOVERNOR OF OUR TIME. Welcome back my able Governor, ur blessed. Mr governor live girl alone for ur dear life! God will judge him for travelling abroad for treatment? Smh...like u wouldn't do same if u were in his shoes.